Ealing Half Marathon have confirmed Ealing Fields High School as the winner of the 2018 Schools Challenge. The 2018 event saw a range of primary and secondary schools from all over London take part and raise nearly £28,000 between them. Ealing Fields school raised more than any other school based on average per runner at the 2018 Ealing Half Marathon, which took place on Sunday 30th September. The school was presented with a cheque for £250 this week to recognise their efforts and achievement. The school used funds raised on a new minibus, just as last year one school put the money towards new computers. These are great examples of how funds raised at the Ealing Half Marathon can be invested to meet specific school needs. Ealing Fields High School students with Mr Woodham, Aled Davies and Juliet Doe who were part of the running team along with Susan Simpson and Mohit Jain. The Schools Challenge encourages schools to enter their own teams into the Ealing Half Marathon in order to raise money for their individual school. As well as raising vital funds for school projects, taking part in a big sporting event such as the Ealing Half Marathon is a fantastic way to boost fitness and inspire younger generations to keep active. 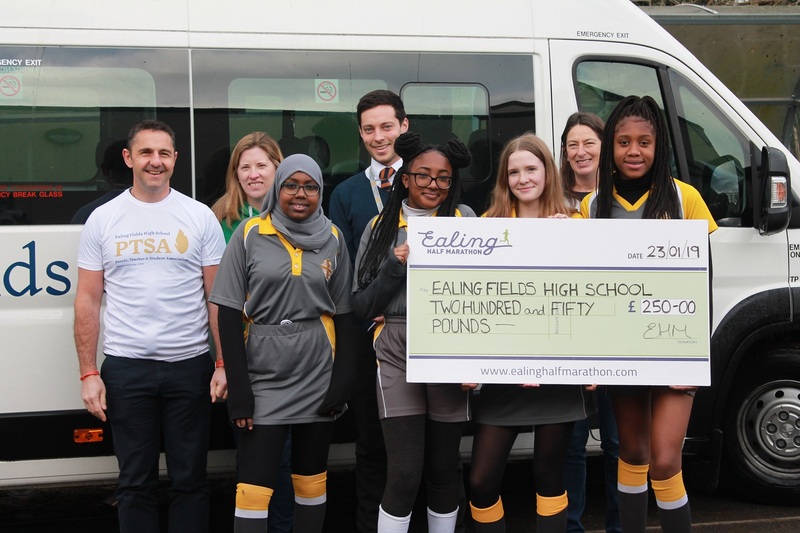 It is hoped that the excellent use of funds at Ealing Fields High School will inspire many more schools in the area to take part in the 2019 Ealing Half Marathon. Many of last years schools and a few new ones have signed up already. With their extensive experience in running, the Ealing Half Marathon team are able to help schools get started with practical training advice, as well as local running clubs, route and nutrition information. With eight months until race day, there is plenty of time for parents, governors and teachers of all abilities to get race fit and look forward to a superb race next autumn. The Ealing Half Marathon is a firm fixture in the autumn running calendar and has become a big favourite among the running community. Set up in 2012 as a legacy to London’s Olympic Games, it will be celebrating its eighth anniversary in 2019. Over the past five years, the event has received three Gold awards and two Silver awards for the UK’s Best Half Marathon at The Running Awards. It welcomes runners from near and far wanting to soak up the famous #EalingFeeling and enjoy the outstanding community support for which the event is known. The UKA-measured, 13.1-mile course takes runners on closed roads through Central Ealing, Montpelier, Pitshanger, West Ealing, Hanwell and St Stephens before crossing the finish line in Lammas Park. The Ealing Mini Mile and the Family Mile will take place on Saturday 28th September, giving young runners aged 1-16 years the chance to enjoy the thrill of a large sporting event. Just a handful of places remain for our younger runners. Race Director Sandra Courtney commented, “We would like to congratulate Ealing Fields High School for winning the 2018 Ealing Half Marathon Schools Challenge. They put in an incredible effort to train and fundraise for the event and have been rewarded with a fantastic cheque which they can put towards the new minibus. I hope that their achievement will inspire other schools to take up the challenge and enjoy the many benefits of working towards something as part of a team. The 2019 Ealing Half Marathon takes place on Sunday 29th September and discounted early bird entries are available until 31st January 2019, costing £38 (affiliated) or £40 (unaffiliated). Go to www.ealinghalfmarathon.com for further race info. You can also like the Facebook page www.facebook.com/ealinghalf and follow @EalingHalf #EalingFeeling on Twitter and Instagram to keep up to date with all the latest news about the Ealing Half Marathon.